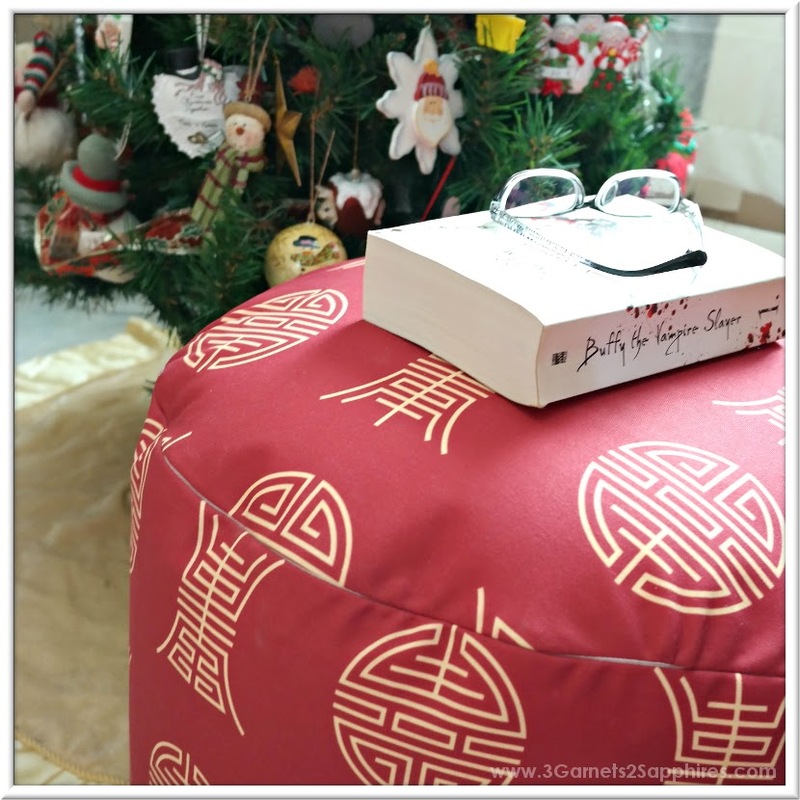 Thank you to Zazzle for providing a sample round pouf for us to base this review upon and for providing a gift certificate for our giveaway prize. All opinions expressed are my own. Over the years, Zazzle has grown significantly as far as the types of custom products they offer. Take their home decor selection, for example. You may expect to see throws, pillows, mugs, and tree ornaments when you visit their site, but you will find so much more. Upon visiting Zazzle.com recently, I was delighted to find lamps, cutting boards, serving trays, plates, bowls, tree skirts, Christmas stockings, and even wrapping paper! Of all the wonderful home furnishings items I had discovered, the poufs were my favorite of all. 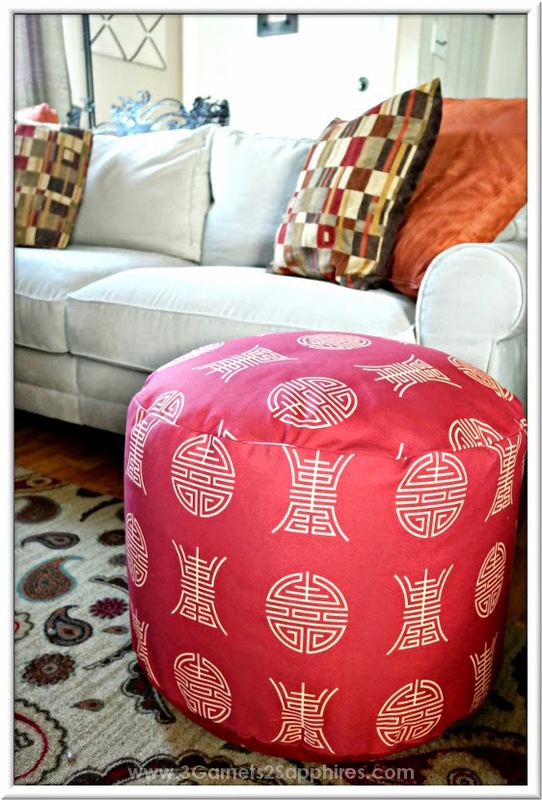 When I first saw the Luck & Longevity Round Pouf, I knew it would be perfect for our home. I love the Asian flair and it was an easy way to add another seat in our living room without adding a large piece of furniture. Of course, you would need to find the right pouf for you. With currently 43,513 cube and round poufs to choose from and the ability to customize your item, I don't foresee a problem with finding exactly what you need. There are styles that are suitable for nurseries, dorm rooms, mancaves, and everything in between. Many styles can be personalized with a name or a monogram, whether your are choosing a trendy chevron pouf or one that's in your favorite team colors. If you truly cannot find exactly what you're looking for, then you always have the option to design your own pouf by uploading your own images for the top and sides. I always thought it would be cool to create a mosaic image using photos of my children, my husband, and myself from different stages of our lives. What design would you put on a custom square or round pouf? To view all the home decor items available, visit www.Zazzle.com, where you could finish almost all your holiday shopping in just one stop! Be sure to sign up for the Zazzle newsletter to stay in the know about special offers and Zazzle promo codes during the holiday season and throughout the year. This giveaway is open to U.S only. You do not need to be a blogger to enter, but you must have a valid email address and be age 18 years or older. A random drawing will be held shortly after the contest closing. The winner will be announced here and will be contacted via email. If the winner does not respond within 48 hours, a new winner will be drawn.